As-salamu Alaikum sister, as new revert I was wondering if you could help me out with some of things. 1) It’s summer, how should I keep cool while still wearing hijab? What about going to pools/beaches? 2) What tips do you have for remembering how to conduct salah correctly and knowing the prayers by heart? 3) What are the most important things for me to know about going to Mosque? Thank you! First off, congratulations on your reversion to Islam and May Allah make everything easier for you. Of course I don’t mind answering your questions, if you have anymore I’d be happy to try to help. 1) When I first started wearing the hijab, I was scared to death of the summer time because I thought it would be incredibly hot and I’d die of the heat (i was a dramatic one lol), but it really isn’t bad at all. You quickly get used to it. I have a modest fashion blog called Her Name is Modesty, there are plenty of modest summer outfit ideas there. 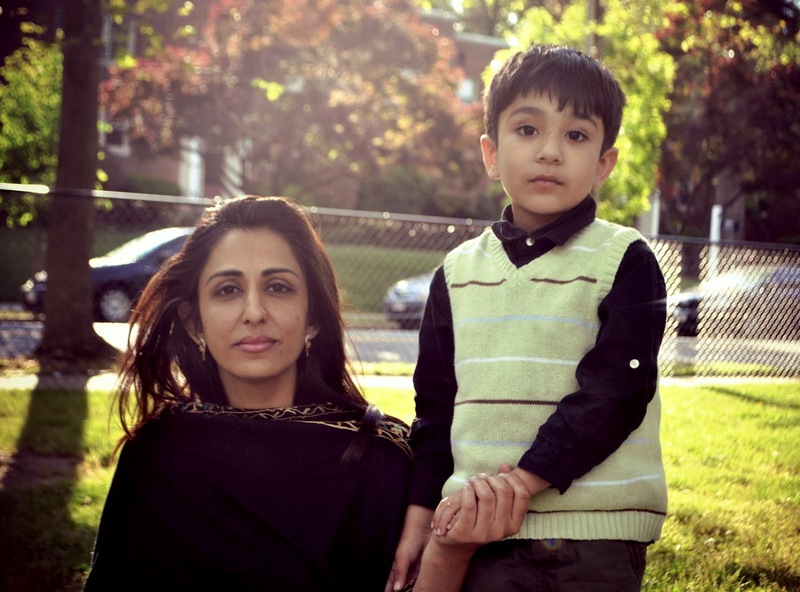 During the summer time, women who wear the hijab usually stick with maxi dresses and skirts. You can also wear pants and not be hot. If I were wearing pants, I would just pair it with a tank top and cardigan. There are also options with the hijab. You don’t need to wear a thick scarf, go for a light breezy preferably cotton scarf to keep cool. There are also different styles you can wear your hijab to keep cool, don’t wrap it too tight around your face, that could also make you really hot. If you want to go to the pool or beach, there’s a lovely option called the burqini lol see here. It’s really not that attractive, but if you’re desperate to get in the water, go for it. Otherwise, I usually just wear regular clothes and get in the water at maybe knee level. You can always go to an all girls pool. It’s a sacrifice you have to make for Allah, of course you can go swimming, but if it’s too difficult and there’s no way to dress comfortably and go swimming maybe you can let it go until you find a better option? 2) When remembering how to conduct the salah correctly, the best tip I have is practice. Try to practice a few times before you actually pray. Take a look at this, it shows you how to pray and what to say. If you mess up, it’s okay. Allah is the Most Forgiving, you’ll figure it out eventually. Also when memorizing the prayers, practice over and over again. Write it out in English transliteration if it helps you. Find a Muslim who can help you with knowing the prayers by heart. It really helps if you have someone there to listen to you recite the prayers and correct you when you make a mistake. - Dress modestly even if you don’t wear the hijab everyday, wear it to the mosque. If you didn’t know already, the hijab consists of you covering everything but the face and hands. - You should be clean. Make wudu (ablution) and make sure your clothes are also clean. Watch this video if you want to learn how to make proper wudu and learn what to say before and afterwards. - The prayer area in the mosque is divided between the men and women, so you should go to the women’s section. If you don’t know where it is, just ask, I’m sure someone will be happy to help you. I've gotten a few Islamic related questions on my tumblr page lately that I thought I would share with you all. I'm clearly not a scholar so I pray to Allah to forgive me if I misguide anyone with my response. I did a bit of research to answer this person's question and here's what I came up with. I have a question for you: how do you not feel bad eating halal meat? The western way of doing it is that the animal dies instantly, whereas with halal because they cut the 3 main arteries, the animal suffers and bleeds before it dies. Nobody deserves that kind of treatment! It's evil to make an animal suffer if it doesn't need to. I don’t feel bad eating halal meat because I know that the animal was slaughtered in a manner where the animal experienced the least amount of pain possible and also in the name of God. My understanding of the Western way of killing animals before slaughtering them is to stun them, electrocute them, shoot them, wring their necks in the case of chickens, etc. all which cause severe pain to the animal. The halal way of slaughtering animals is very humane and scientifically good and not cruel like some people might believe. For an animal to be killed in a halal manner the animal needs to be slaughtered with a sharp knife taken across the neck very quickly to minimize the pain. The wind pipe, the throat, and the vessels of the neck are cut. Cutting all of this allows all the blood to be drained from the animal’s body. If the blood isn’t completely drained, as it isn’t in the Western way, germs, bacteria, and toxins are left in the animal and consumed by humans, which obviously isn’t healthy for humans. That makes the halal way of slaughtering scientifically more healthy for humans, and morally, halal slaughtering is better for the animal even though it might not appear like that visually. Despite the way it appears, the Islamic halal way of slaughtering animals is actually designed to make sure that the animals go through the least amount of pain possible. When the knife is used to quickly cut the vessels of the animal, the flow of blood to the nerve in the brain responsible for pain is disconnected therefore there is no pain. Even though it looks like the animal is suffering and struggling, it’s not, it’s the normal process the animal goes through when contracting and relaxing it’s muscles due to the blood loss. Islam doesn’t permit humans to harm each other or animals. Both the Quran and hadith (sayings of the Prophet Muhammad peace be upon him) emphasize that animals should be treated as humanely as possible. Slaughtering animals through the halal way is not intended to be cruel and it is not believed to be cruel. If you believe that electrocuting or stunning an animal before slaughtering it is better then that’s your opinion. I personally believe that the halal way is morally better for both the animal and the human who is going to eat it. There is no non-violent or pleasant way for animals to be slaughtered, so I think in the end it’s up to you and what you believe is morally correct. One of my followers on my personal tumblr page who is considering reverting from Christianity to Islam asked me this question: If someone were considering reverting to Islam, what would you say that Islam offers that makes it unique? What would you tell him/her about Islam to help him/her make a final decision on whether or not it was for him/her? How would you address some of the common misconceptions or concerns about Islam in getting people to understand the true message of the religion? I believe what makes Islam unique is its foundation. The word Islam itself is rooted from “salam” which means peace. Islam means submission to the one true God (Allah) and one who submits to the will of Allah is a Muslim. When you look at other religions like Christianity, Judaism, Buddhism, Hinduism, or Confucianism they are all essentially named after people or a place in the case of Judaism. Christianity is named after Jesus Christ, Buddhism after Gotama Buddha, Confucianism after Confucious, Hinduism after the Hindus, and Judaism after the land of Judea. Islam is unique because its name does not refer to any human being, not even to the Prophet Muhammad peace be upon him. It is pure in that sense and clarifies that all praise, worship, and submission should be to God alone and not to any human being. For people that follow the faiths of Christianity or Judaism, I would tell them to look into the belief that Islam is the completion of the three Abrahamic faiths. 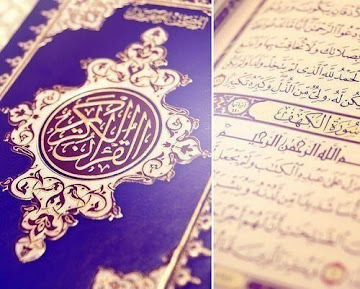 Muslims believe this based on this Quranic verse: “Today I completed your religion and completed My favor on you and chosen for you Islam as your religion” (5:3) Christianity, Judaism, and Islam have the same foundation, that there is only one God. Islam believes in Jesus, Mary, Moses, and all the prophets that exist in the Torah and the Bible. Islam shares so much in common with them. The main major difference is that Islam does not believe that Jesus is the son of God or God in any shape or form. That’s another thing that makes Islam unique. Islam has stayed true to the original message of the Abrahamic faiths and to the origin of Islam which I mentioned is submission to one God. I would tell him/her to first of all put aside all the fears they have about their family, about society, about this life and to look at Islam purely. While Islam focuses on the role of the ummah (the Muslim community) in the life of a Muslim, Islam is really just a religion or a form of communication between you and God. There is no priest or any barrier between you and God. 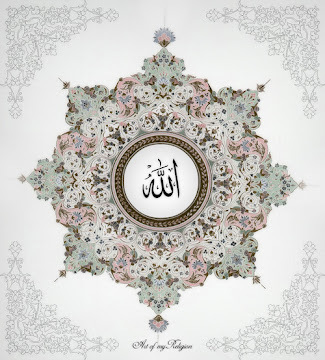 Five times a day, you get to meet with Allah and ask him for what you want, thank him, and ask for his forgiveness. 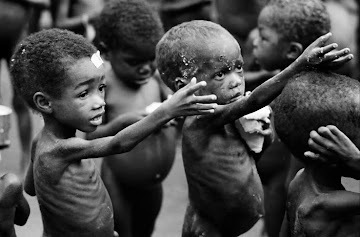 I would tell them that Islam says that Allah is the most merciful. Islam really is the religion of forgiveness, tolerance, and equality. People usually have a misconception about Islam. They think that Muslims are very strict because they pray 5 times a day or because the women cover or simply because they try to follow the Quran the best way that they can. Islam is not a religion for the perfect, Islam is for the broken. Islam is there to guide and heal people, to provide them with guidelines on how to live their lives in the best way that God envisioned it to be. I would tell someone who was considering becoming a Muslim to not fear the things that God prescribed Muslims to do like praying, fasting, not drinking alcohol, etc. Allah judges based on intentions and He knows what’s in everyone’s heart, so if someone’s intent is to worship God alone then I would say just say your testimony of faith (shahada) la ilaha ila Allah Muhammad rasul Allah (There is no God but God, Muhammad is his last and final messenger) and take it from there one step at a time. 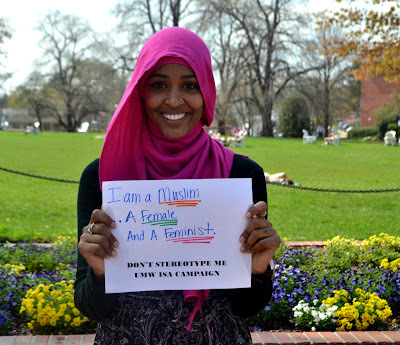 Islam really is for everyone. Like I said, Islam advocates tolerance. 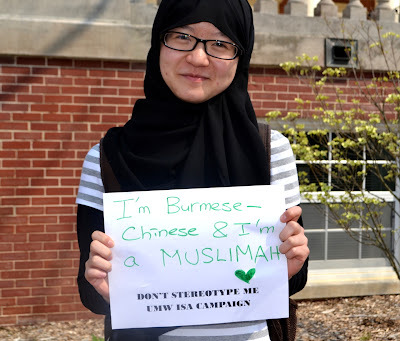 There are over 1.6 billion Muslims around the world from all ethnicities, backgrounds, etc. The Prophet Muhammad Peace Be Upon Him said, The Prophet Muhammad said, “No babe is born but upon Fitra (as a Muslim). It is his parents who make him a Jew or a Christian or a Polytheist.” (Sahih Muslim, Book 033, Number 6426) Muslims believe that everyone is born a Muslim, that’s why people who become Muslim are usually called reverts rather than converts. When addressing the common misconceptions or concerns about Islam, first I feel like one must realize that Islam has nothing to hide. Islam advises people to ask questions and learn, rather than blindly believe. When looking for the answers to misconceptions, one has to look at the right sources and ask the right people and not look around on just any internet site because especially today people are really ignorant about Islam and attack it without knowing anything about it. I think the best way to get people to see the beauty of Islam is to live it in your life. People believe what they see with their own eyes, so when people see a Muslim living their life in a good way, the misconceptions they have about Islam will gradually disappear. Also educating people by clarifying the misconceptions and concerns helps because people won’t learn unless their told. I've been meaning to watch the film Arranged for a while but I never got around to it until tonight. I heard so many wonderful things about it and loved watching every minute of it. This movie is beautiful and carries the theme: "Friendship has no religion." Arranged is a film about a growing friendship between an Orthodox Jewish woman and a Muslim woman who meet during their first year teaching at a public school in Brooklyn, New York. They find that they have so much in common and learn that they are both undergoing the process of an arranged marriage. Before watching this movie, I honestly did not realize how much Orthodox Jews and Muslims had in common. There were very few differences between the two women and I really liked that the film showed that. Most films focus that center on the Islam depict Islam in a negative light, but not this film. It showed the truth. It showed that Muslim women, as well as Orthodox Jewish women can follow their faiths while also being strong and make their own choices. 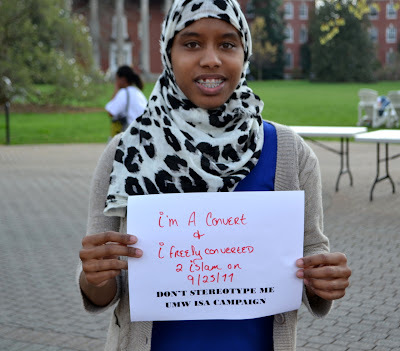 In March my university, the university of Mary Washington's Islamic Student Association was inspired to launch a campaign against stereotyping and judging. We had witnessed the atrocities of the Trayvon Martin case and thought why not combat stereotyping on campus. 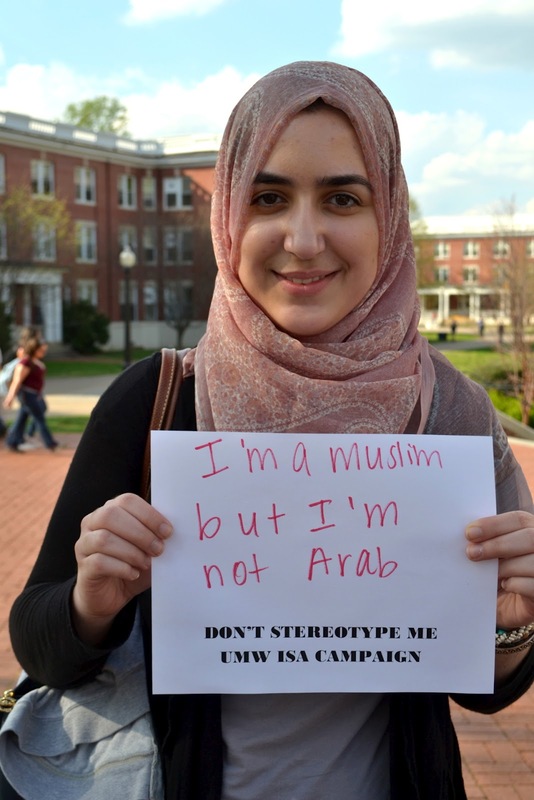 Trayvon Martin, and later Shaima Alawadi both were victims of stereotyping essentially and we thought to ourselves: how crazy is it that something as simple as a stereotype could eventually lead to someone being killed? Everyday we stereotype each other and juge each other without really knowing anything about those that we make preconceived notions about. This campaign was a huge success both at my university and online. I posted this on my tumblr page and alhamdulilah it got as of today 6,651 likes and reblogs which is awesome. Although this is late, here is a collection of some of the photos. We're Both Blonde and White, but We Were Born Muslim! I hope you guys enjoyed these photos and reading these stereotypes. 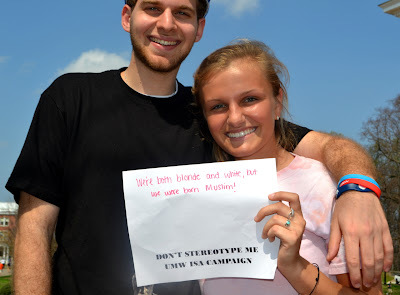 Let me know what you think and what have you been stereotyped as before? Every time I make a post on this blog I always feel like it's been a while. This is my millionth attempt at being consistent with my posts on here so inshAllah this time I'll actually keep my word and post more. Over the past couple months, I've really grown in my interest in photography. I take lots and lots of pictures to the point that my computer is now full and I need to get an exterior hard drive. Photography is a reflection of my life and how I perceive the world, so a lot of the times my favorite things to capture are subjects that remind me of Allah and Islam. I love capturing people worshiping Allah or simply capturing Allah's beautiful creations. It is so easy to find Allah in everything I see subhanAllah. If you would like to see more of my other pictures, please refer to my Flickr. Seeing Muslim reverts always reminds me to be grateful for being born a Muslim and to constantly work at increasing my faith. Whenever I see people that weren't born Muslims practicing Islam better than the majority of born Muslims it always reinforces the fact that guidance is something precious and that being a Muslim doesn't only mean saying La Ilaha Ila Allah, but actually practicing it everyday. The best kind of beauty is modest beauty. I'm always amazed when a Muslim woman can wear a black abaya and still light up a room. It tells me that there is no one definition of beauty. The type of beauty that radiates from Muslim women is truly the beauty of the heart. It is said that it is recommended to recite Sourat al-Kahf the night before Friday, and it is also recommended to do so Friday, before Maghrib time. Bismillah, alhamdullillah, subhana-lathiee sakhara lana hatha wamaa kunna lahu muqrineen, wa inna ila Rabbina lamun-qaliboon. alhamdu lillaah, alhamdu lillaah, alhamdu lillaah, Allaahu 'Akbar, Allaahu 'Akbar, Allaahu 'Akbar, subhaanakal-laahumma 'innee dhalamtu nafsee faghfir lee, fa'innahu laa yaghfiruth-thunooba 'illaa 'Anta. Reference: Abu Dawud 3/34, At-Tirmithi 5/501. See also Al-Albani, Sahih At-Tirmithi3/156. I was just thinking about how ironic it is that I feel more comfortable wearing the hijab and working on increasing my faith in America, than I do in my home country, Sudan. In Sudan, a lot of women wear the head scarf for cultural reasons, not religious so when people see me wearing the hijab strictly for Islamic reasons they kind of crack jokes at me. I remember last summer was the first time I wore the hijab in Sudan and I had more troubles there than I did in America subhanAllah. Whenever my mom’s cousins or other men who weren’t my mahrams would come to our house I’d rush to put on my hijab as soon as I saw them and they’d sort of laugh at me and tell me that I was being over religious and that they were just like a father to me. I feel like people in some Islamic countries sometimes take Islam as though it’s a culture and not a religion. I was surprised that women in Sudan didn’t go to Friday prayer and people again laughed when I asked to go. They told me only old women go to Friday prayer. I went to taraweeh prayers during Ramadan last time I went to Sudan and there weren’t many women there, let alone women my age. I feel like Muslims in Muslim countries should be more appreciative of Islam, but I don’t think they really are. Many take hearing the call to prayer 5 times a day for granted and don’t understand how amazing it is to have a mosque on every street corner. We don’t have that in the West. I would love to hear the call to prayer, but right now all I have access to is the athan on my lap top. When I came back to America from Sudan 2 summers ago, I was relieved that I was around my Muslim friends and the Muslim community that understands that Islam is special and that imaan is precious and needs constant care in order for it to grow and not fade.